Phek is at work and couldn’t post these, so I have to jump in. Unfortunately, I can’t provide any elucidating commentary on intricacies of official merchandise, and can’t explain what the implications of Hasbro’s use of Swarovski crystals are beyond what a quick Google search reveals, but do not fret, Phek will be back! 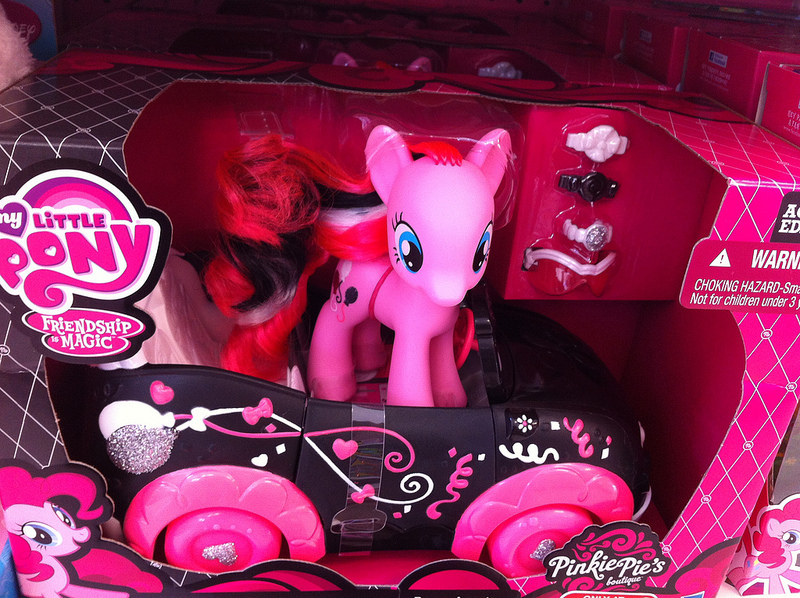 The above image was submitted to her Tumblr blog, a black-haired fashion-style Pinkie Pie with a car. Unfortunately, Google’s reverse image search is notoriously bad at crawling and indexing Yahoo’s Flickr, and TinEye can’t find it either, so I will have to rely on the photographer’s assistance in sourcing the image. Below, two images of a fashion-style Alicorn Twilight with the aforementioned Swarovski crystals. Here Phek observes parallels to a previous disclosure relating to Vinyl Scratch. The Hasbro Toy Shop has more details. This elegant Princess Twilight Sparkle figure sparkles like no other pony with the crystal fire of Swarovski! She’s got the flowing hair and tail of a princess, but it’s the crystal gems on her wings and the golden glitter of her shoes that give her a truly royal look. She’ll add a brilliant touch of class to your collection! Beautiful Princess Twilight Sparkle figure – decorated with beautiful crystal elements by Swarovski. Her horn and shoes are decorated with glitter!